Last year my brother’s friend, Brian Bianski , gave me some garlic shoots. I didn’t have the first idea what to do with them, so I brought them home and stuck them in the ground. 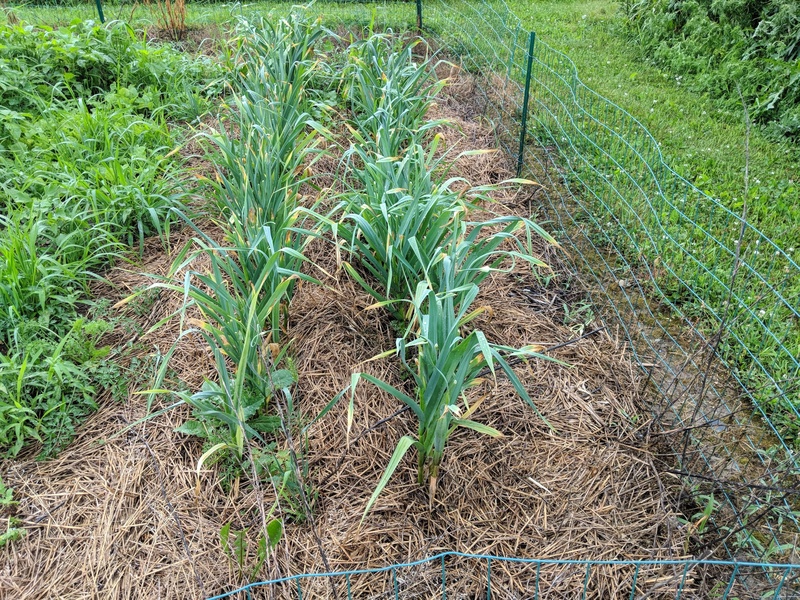 Then this spring the garlic burst forth. In June the garlic sends out flower buds. You’re supposed to cut those off so the plant will put its energy into the cloves underground. These flower buds are called garlic scapes and they have garlic flavor just like the cloves. 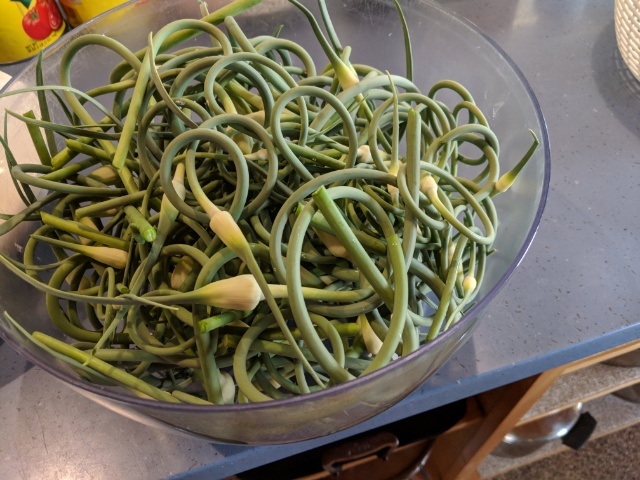 So I had a big bowl full of garlic scapes and wondered what to do with them. I looked up recipes and found a recipe for a double garlic soup that used garlic scapes and green garlic. Scapes, I have plenty of, but what’s green garlic? A little more searching and I found out that green garlic is immature garlic cloves. I’ve got plenty of those too! These are a couple I dug from my garlic patch. They’re a little past the ‘green’ stage, but they’re still soft and mild, so close enough! 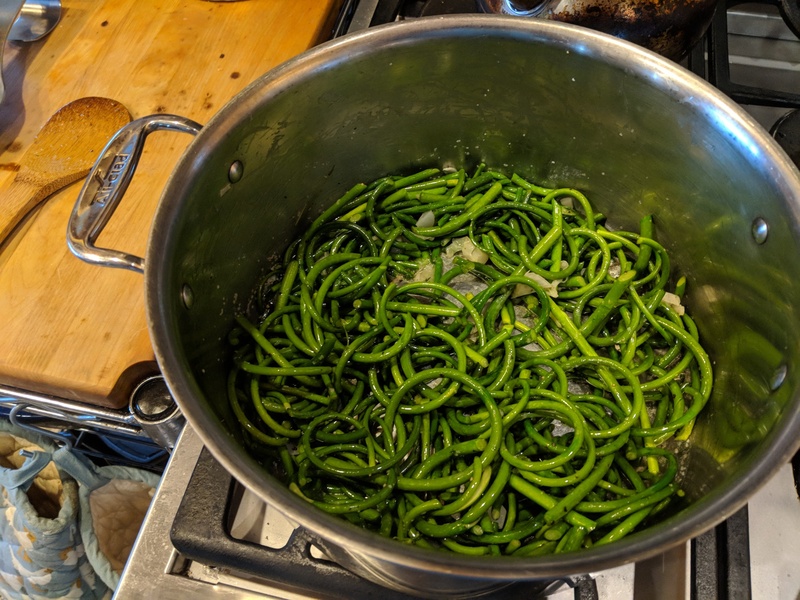 The scapes and green garlic all went into the pot. Then I added stock and so on as the recipe below calls for. I made a few croutons with lots of salt and garlic and parmesan cheese to sprinkle over the soup to add a bit of crunch to the bowl. It was just splendid. A delicious meal from the scraps of pruning the garlic patch and the thoughts of good friends. 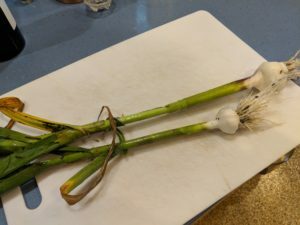 Trim the root and green part of the green garlic, and remove the outermost layers, then chop it finely. In a soup pot, melt butter over medium-high heat. Add green garlic and sauté until translucent, about 3 minutes. Add garlic scapes, thyme, salt and pepper, and sauté for 5 minutes. Stir in diced potato and broth, reduce heat to medium, and simmer until scapes and potatoes are tender, about 20 minutes. Add half-and-half, and purée soup with a blender. Stir in the lemon juice and season with more salt and pepper. Garnish with nutmeg and thyme leaves, and serve hot. Add garlic parmesan croutons to make it a triple garlic soup! 1. I hadn’t seen Brian since high school. A few years after Dave died I was standing in Ranney’s Welding Shop in Churubusco talking with Ranney about welding a part for me and I felt someone staring at me from the side. I turned and he (Brian) said, “Chuck? You freaked me out, you sounded just like Dave.” I think we all still expect to turn and find Dave there. This is Phyllis Sherwin here. 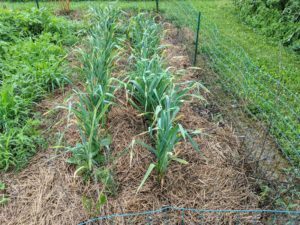 I’d like to share your article above on garlic shavings and your recipe using garlic and garlic scapes with an old school friend of mine who lives down near the bridge going over to Louisville. He grows garlic and has actually shared a bulb or two with me. I know he’d love your idea of garlic shavings. I hope I have your permission to share this with him. Also i used to have your sugar cream pie that was in the paper but I seem to have lost it in our move. I’d like to have it if you don’t mind. Just email to me at [email protected]. Thank you, Chuck. I enjoy reading your postings here. Stop, think, there must be a harder way.